Since there are many very interesting blogs about tea, I decided to share some of my favourite articles. Imen, owner of Teahabitat wrote about current weather in China and how it affects tea production. I really like her enthusiasm and huge knowledge about tea, especially Dan Cong oolongs. And when she wrotes, that the tea production will be bad, I'm starting to tremble. An interesting insight on tea history and chinese history by MarshallN. Slovakia, country in the very heart of Central Europe has very dry climate. 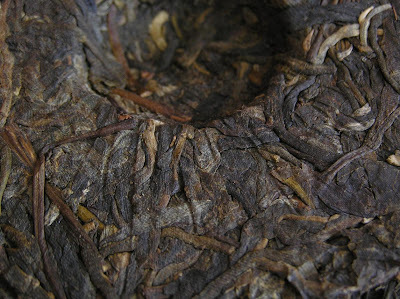 And as we know, too dry climate isn't good for pu-erh. Well, it maybe does not hurt our beloved tea, but at least stops it from aging. And the concrete buildings most Slovaks live in are especially bone dry. So how can I help my pu-erh stash to age? First of all, by carefully choosing the beengs. Some are more suitable to prosper here, some are not. As I see it, more compressed the pu-erh is, slower it age. The more compressed tea needs more humid environment. Let’s have a look at this Xiaguan FT#4 beeng (sold by Yunnan Sourcing, reviewed by Hobbes). This is one of the hardest beengs I ever saw. Pure solid rock. Actually, I do not understand, why is pressed so much. Certainly, it is smaller, and maybe the tea changes slower, but still. If you click the picture, you can see, how the hydraulic press used to make this beeng constricted the mao cha. Breaking the cake without damaging the leaves is impossible. Even if the borders are somewhat loose, the cake is a compound of tea leaves. By the way, Xiaguan is famous for it's stone-hard tou’s, too. The Chinese can use them instead of cobble-stones during citizen unrests. Don't forget the words of Edward Bulwer-Lytton "The pen is mightier than the sword and it is nearly as mighty as a thrown Xiaguan tuo cha". 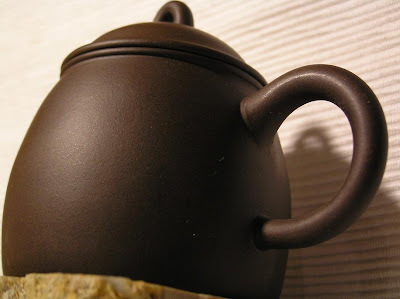 Another tea, that surprised me with it’s heavy compression is 2005 1st SoutEast Asia Pu-erh Trade Memorial Cake (sold by Hou De, reviewed by Hobbes). As a flagship of Chang Tai I expected somewhat more loose cake. Please notice both the front side and the back of the cake. As in the Xiaguan cake, the leaves are mangled together, the tea-drinker does not have a chance to separate the leaves. Maybe it is just an aesthetic problem, but it is still a problem for me. By the way, this is why I never judge the leaves in pu-erh samples – because the piece torn from the cake nearly never contains whole leaves, even if the cake itself has most of them complete. As an example, I took a photo of 2007 Xi Zhi Hao Da Xue Shan – one of the most beautiful cakes I saw. If you check the photo bellow, it is exactly the same part of the cake, as the picture of Chang Tai cake above – the hole from the knob. Where the Chang Tai cake has plastic-looking hole, Xi Zhi Hao has something that reminds me of a bird nest. While the cake is still compact, the leaves are with some care easy to loose just by hands. Also, on the photo bellow of bottom side of Xi Zhi Hao cake, you can clearly see each one separate hairy tea leave. On Chang Tai cake you can see the imprint of the bag the cake was made in. The loose cake is full of air, and that's why I believe that it will age better. This tea can breathe. This tea feels its surroundings. Fortunately, not only the expensive Xi Zhi Hao cakes are of loose compression – for example this Mengku Mu Ye Chun 001 cake is also beautiful (sold by Yunnan Sourcing) - and it’s much cheaper. Classic loose stone-mould compression does not make good tea, but it can make good tea to age better outside of monsoon areas. Well, I will see in next 20 years, if it's true. Two weeks passed since Imen from Teahabitat sent me the samples of Phoenix Dan Cong teas I ordered and today they finally arrived! I was pretty excited when I visited post office seeing the pretty big box - and it was really full. I would like to thank Imen for the additional samples. So this evening I decided to try the 2007 Fall Orchid Dan Cong. I was really tempted to taste the 22 years old one, but I resisted the temptation. Mostly because I’m a bit tired and I do not want to waste that tea when I’m not fully concentrated. 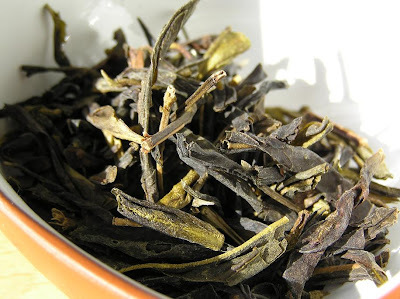 Even if the 2007 Fall Orchid isn’t the highest grade of the Imens offering of Dan Congs, the leaves are nice and the tea is better, than most of the others available at western countries. Imen describes this tea as “sweet honey, floral aroma”. I like the Dan Cong teas because of their unique fragrance – subtle but strong, playful but straight, long lasting and penetrating. In this tea I really found more flower aroma than fruits. I do not meet up many orchids in Slovakia, so I can easily believe, that the smell of orchids is like the fragrance of this tea. As always, this tea is best at the first few brews, but it lasts lots of them. Nice everyday tea. By the way, I'm not sure about the tea when brewing Dan Congs. I feel like using boiling water is too harsh treatment, but when I let the water cool down too much, the taste and aroma of the tea is just too weak. So mostly I just boil the water and then I let it rest a minute or two. Fortunately, the hot water does not damage the Dan Cong as it could damage green tea. When I look at my teas, most of the time I remember, when I purchased the tea, from whom and what was it name. And in the case of pu-erh I have evidence with names, producers, photos of wrapper and so, because my memory is much shorter, than my pu-erh stash. When I purchase some tea, mostly, when I’m back home I put it into corresponding jar to keep the tea fresh. And because my jars aren’t labeled, sometimes I know what tea is inside, sometimes not. Today my memory does not worked too well, so I had mystery tea. I got 50 grams of this Dan Cong oolong from local vendor Longfeng.cz. I know, that it’s his top single bush Dan Cong – unfortunately, it’s out of stock right now, so I cannot check on his web, what it is exactly. But since he gets his teas from JingTeaShop, I checked it there and I believe that it’s Single Bush Ba Xian Dancong. Or it isn’t. Who knows…? The dry leaves emit beautiful fragrance, come gentle spices mixed with orchids and citrus fruits. Even if most of the Dan Cong oolongs smell and taste beautiful, this one is especially calm, and ideal tea for silent afternoon. Even the color of dry leaves – some are darker, some are very bright green – calms the stressed mind. The most amazing on this tea is its smell. I believe this is the tea you should enjoy with a Wenxiangbei. The aroma contains tea, spices and orchids. And by tea I mean the smell of the tea I used to drink while I was a young boy. Lovely mix. But even if the tea is calm, the leaves are quiet powerful, they last lots of infusions without loosing the taste. Even if some find the Dan Cong oolongs boring and uninteresting, because they lack the ability to change in subsequent infusions, I like them being a tasty and inspiring companion. Update: I discovered, that the tea really is Single Bush Ba Xian Dan Cong. I'm sure many tea fans have tons of yixing teapots. Some are used frequently, some are just display items. I own few yixing, too. Some is good, some is not so good. But I remember the story of each one piece. First of all - where can I get yixing? Since I never was in China or Taiwan, my only chances are local or internet vendors. Unfortunately, most pieces I can get in Slovakia is of very poor quality. And if I order online, there is a chance, that I will got something else, than I believed to get. Now you have to know, that I’m in the position, when I have more yixing, than I can use. Well, I use nearly all of them, but some of those precious pieces of art see their use maybe once a month… And this is bad. I do not like them to just sit on the shelf. So I decided not to buy anymore of them. Unfortunately, my greediness is probably much stronger than me. And when I saw this small piece (xiao pin) at Guang’s website, the urge to hold it in my hands was stronger than my decision not to buy more yixing. Just check out this little guy. My first thought, when I saw him, was - he's just like a small, strong dwarf! 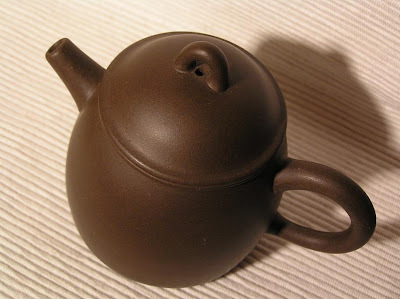 If you saw Peter Jackson's Lord Of The Lirng, Gimpli as a yixing teapot would look just like this. Small, sturdy, radiating hidden power. 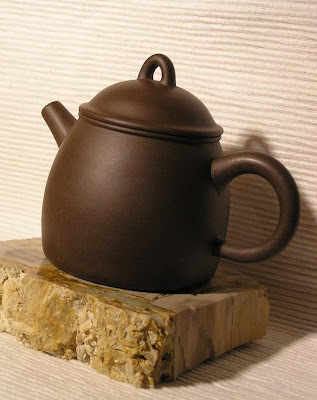 Also, if you check the photo above, you can see the high quality, solid zi sha that was used to make this teapot. 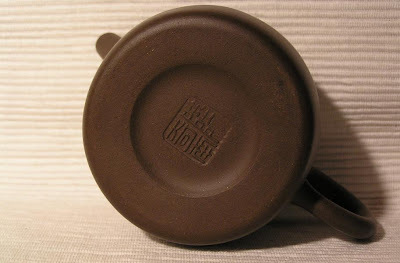 Chocolate brown clay, with nice structure and solid feeling. When I said solid feeling – check out this interesting article about how yixing is made. The idea of “slip casting” yixing is very strange to me. I believed that most of the yixing is hand made by underpaid Chinese craftsman. And now I see that most of it is only cast using moulds. It is horrific, but somehow not surprising fact. 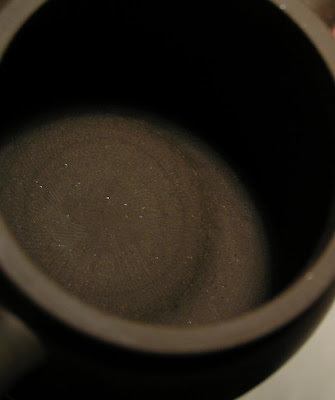 Fortunately, if you check the inside of this teapot (click the picture to enlarge), you can see the “scars” the maker left while arranging the inside of the teapot. So this is at least partially hand-made. That also explains the nice feeling of the teapot. I like this teapot. It has some flaws – it leaks a bit when pouring, it does not have built-in strainer. Maybe I will not use it frequently, but when I will drink some high-fired wu yi oolong, I will feel the spirit that teapot have. PS: Is there someone, who can help me to translate the Chinese calligraphy on seals? Most of the teas, unlike pu-erh are best while fresh. Only pu-erh and some oolongs become better aged. So if you encounter some fine green tea, if it's older than 3 months, probably you already missed its peak. But what could be the freshest tea you ever tasted? Today you can try teas only a few weeks after they were made. But on my last trip to Prague I found a special tea, maybe the freshest I ever tasted. No, it isn't Ice Tea you can buy in PET bottles. It's a regular high quality Te Guan Yin that wasn't dried in a pan as the last step of making, but it was frozen instead. I like to thing about it as tea hibernation. Just check the chunk of frozen Te Guan Yin as I pulled it from the pack. The big problem with this tea is that it has to be frozen all the time. The teashop owner nearly rejected to sell it to me, because he was afraid, that the tea will worsen in my way to home - I live in Slovakia, 4 hours by train from Prague. Luckily, I was able to persuade him, that in January it will be ok.
Few minutes later were the leaves ready to brew the tea. Please, note how green they were - much greener, than the standard Te Guan Yin is. Also, they were clearly hand-picked, with lots of stems. What struck me down was their smell - very strong, very powerful, and very vegetal. This is how the fresh tea should smell. I brew the tea with nearly boiling water, as the tea master showed me. The brew was light yellow. Again, the taste was typical Te Guan Yin, except I found some citrus flavors I do not expect in standard Te Guan Yin. The tea was thick, strong with long lasting round aftertaste. Also, it survived 10+ infusions very well. The leaves were not the highest quality - I found a lots of 3 leaves and a bud or even 4, 5 leaves on a single stem. They were rather big with rather strong veins. On the other hand, the stems were still pretty soft, so the leaves were young enough.